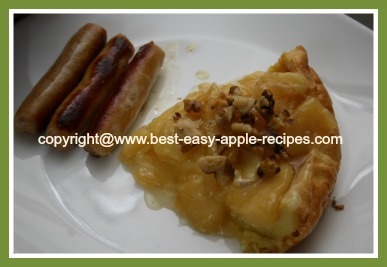 This Apple Puff Pancake Recipe is made using apple pie filling. 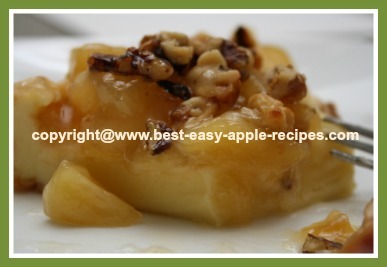 Use store purchased pie filling or homemade pie filling for this recipe. 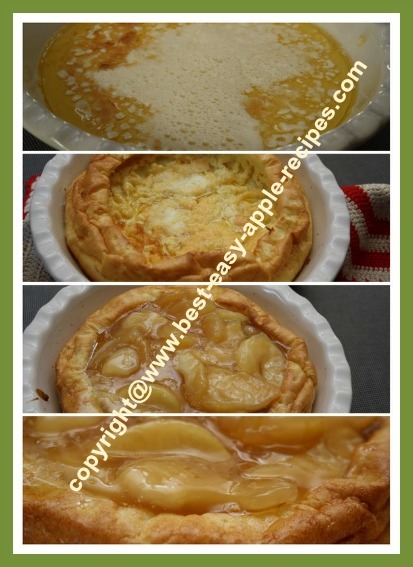 A quick and easy apple pancake recipe for a special brunch, breakfast or lunch-time treat! This recipe will work equally well using peach pie filling in the place of the apple pie filling. Add the butter to a 10" (approx.) size oven-proof skillet, or a pie dish. Place in a 425°F oven until the butter has melted. In a large mixing bowl, beat the eggs, using an electric hand mixer. Add the flour, milk and the salt and continue to beat mixture until smooth and well blended. Pour batter into the hot skillet (or pie dish), allowing the batter to from up the sides of the skillet. Bake for about 15 - 20 minutes or until the edges of the pancake are golden brown. In a small saucepan, warm the pie filling over low heat until thoroughly heated. Pour the heated pie filling into the center of the pancake. Apples are a good source of flavonoids, which have antioxidant properties. It is believed that most of this compound in apples is found in the peel. It is beneficial to your health to eat apples without peeling off the apple skin. Eating Apples provides a good way to increase dietary fibre, in fact, an average size apple is said to contain more fibre than a bowl of oatmeal or most cold cereals! An average size apple contains about 80 calories.